This Philips Hue White Starter Kit has everything you need to get started with smart lighting. It contains four bulbs and a bridge to operate them. This kit lets you to control your lights from anywhere with an internet connection and can even be automated when you're away for extra peace of mind. Illuminate up your home with smart lighting. The Philips Hue White Starter Kit consists of four warm white light bulbs that you can dim and turn on and off with your phone, either from the included Google Home Hub’s touch screen interface or with your voice. Set schedules, sync lights with sunrise and sunset, and even control lights on the go. Couldn’t we all use a little more convenience in our lives? The Philips Hue White Starter Kit helps keep your home running smoothly: Set schedules, turn lights on and off with your voice or with your smartphone. The included Google Home Hub lets you manage all your smart home devices from its easy to use touchscreen interface. The Hub also functions as a digital photo album and lets you stream music and video. “Home View” control: The Google Home Hub lets you control all your Google Home compatible devices from its easy to use touch screen interface. You can even group your Philip Hue smart lights and other smart devices into separate rooms for more targeted control. Voice control: The Hub’s built in Google Assistant lets you dim and turn lights on and off with your voice. Never worry about fumbling for the light switch in the dark again! Ambient EQ The Google Home Hub boasts a light sensor that will automatically adjust the screen’s brightness to its ambient surroundings. So the interface will always be perfectly lit, whether your lights are on or off. Control lights remotely: You can control your lights from the Philips Hue app on your phone no matter where you are in the world, provided you have a Wifi connection. If you’re going to be away for longer periods of time, you could turn your lights on to create the illusion that your home is occupied. Sync lights with sunset and sunrise: Use the app to set lighting schedules to suit your daily routine and even have lights turn on and off in response to the sunset and sunrise. Smart lighting gives you more options and flexibility than standard light bulbs can offer. Instead of relying on old fashioned light switches, you can dim and turn lights on and off on the go or with your voice. Stream video and music from the Google Home Hub and ask the Google Assistant to help with everyday tasks, from finding new recipes to creating shopping lists. We all want a cozy home, but often lack the time to create a homey atmosphere. That’s where the Philips Hue White Starter Kit and Google Home Hub come in: They’ll keep your home feeling like home without you needing to lift a finger. When you share your location with your lights, the bulbs will automatically turn off when you leave home and turn back on when you arrive. Even better, you can set them to dim down in the evening and turn them off altogether with your voice. No need to get out of bed! The Google Home Hub also offers a homey touch: It doubles as a digital photo album to show off all your favorite memories and can begin displaying new photos as soon as you snap them on your phone. Smarts lights are an essential component of any smart home, and the Philips Hue lights are an especially good place to start. The included Hub also offers established smart home fans a simple way to control many smart devices from one interface, without needing to juggle multiple apps at once. Setup is as easy as attaching the Hue Bridge to your router, screwing in the light bulbs, and downloading the Philips Hue app. Simply follow the in app instructions to finish installation. 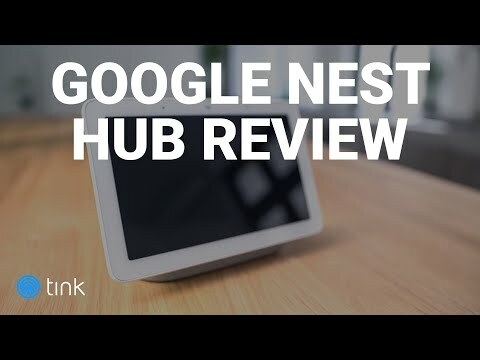 The Google Home Hub is made of premium materials and offers a touch screen interface that automatically adjusts brightness to its ambient surroundings. An organized and easy to use interface makes managing your smart home lighting a breeze. Create digital photo albums, stream music and video, dim and turn lights on and off remotely or with your voice. The smart lights respond immediately to commands made in the app or via voice. The light bulbs offer a traditional design that will blend in with your home decor. The lights communicate with one another using the secure ZigBee protocol. All of the Google Home Hub’s communication carrying user information is authenticated and encrypted. Google Home and Philips Hue are two of the most established names in the smart home world. This package offers great value for high quality, dependable devices. Can the Philips Hue White Starter Kit bulbs change color? No, the Philips Hue White Starter Kit bulbs only give off a warm-white light, which can be dimmed. If you want colored bulbs, you would need to purchase the Philips Hue White and Color Ambiance light bulbs. How many light bulbs can a single Hue Bridge control? A Hue Bridge can control up to 50 bulbs at once. Does the Google Home Hub have a camera for video calls?